272 pages | 2 B/W Illus. "With a sizzling intelligence and a passionate commitment to justice Seema Arora-Jonsson uses empirically rich case studies from forest villages in India and Sweden to challenge taken-for-granted understandings of gender, environment and governance and their intersections. This beautifully written and deeply insightful book is a definite must-read for anyone concerned about these issues." 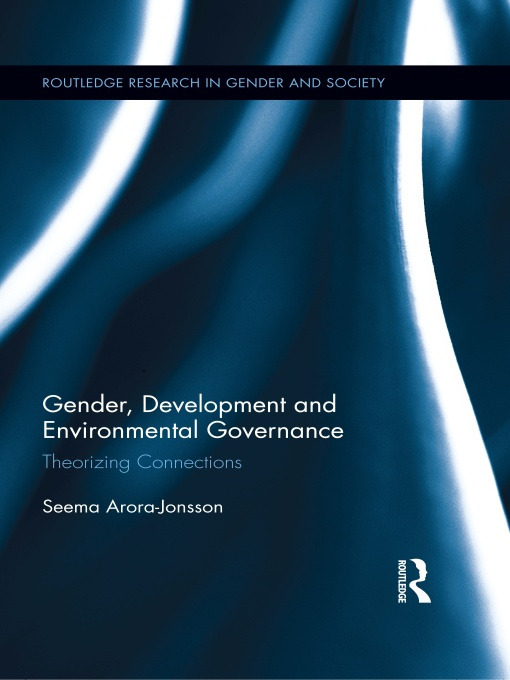 "In Gender, Development, and Environmental Governance, Seema Arora-Jonsson weaves together insights from field experiences and scholarly writings to provide a compelling account of how women can simultaneously be disadvantaged by, contest, and change development and governance outcomes. This book should be required reading for development professionals and decision makers, and anyone interested in gender and development." "With striking precision Arora-Jonsson explores the gendered practices of development in forest communities in India and Sweden. She listens to the subtle messages of village life and leads her readers into social theory. Arora-Jonsson's creative language keeps the reader in steady excitement. This book will be much welcomed in gender studies as well as in broader fields of environmental governance and local development." The book is rich in detailed qualitative data, collected and reflected upon over almost 20 years… The chapters can be read sperately as they all include a contextualization of the topics to be discussed and a conclusion. This format makes it esepcially adaptable as teaching material. Seema Arora-Jonsson is Associate Professor in the Department of Urban and Rural Development at the Swedish University of Agricultural Sciences.